The Philippines will take part in Walt Disney Pictures' global event “TRON Night: An IMAX 3D Experience” on Thursday, Oct. 28 at the IMAX Theaters of SM North EDSA and SM Cebu. Simultaneously scheduled in IMAX cinemas worldwide, “TRON Night” will gives audiences the chance to see more than 20 minutes of never-before-seen 3D footage from Disney's upcoming film, “TRON: Legacy,” a 3D high-tech action-adventure set in a digital world that’s unlike anything ever captured on the big screen. 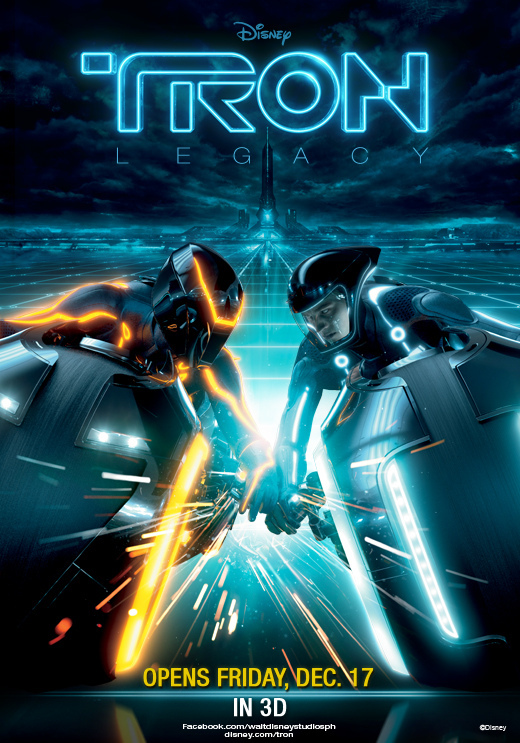 "It's exciting to offer fans an early, exclusive 3D preview of `TRON: Legacy' in the ultimate of formats. We can't wait for audiences around the world to experience the visually stunning and cutting-edge world that director Joe Kosinski has created," said Sean Bailey, President of Production, Walt Disney Studios Motion Pictures. Greg Foster, Chairman and President of IMAX Filmed Entertainment, is equally enthusiastic. "We are ecstatic that the Disney team and the `TRON: Legacy' filmmakers elected to debut this amazing footage exclusively in our network of theaters," said Foster. "This first-look in IMAX 3D is the most immersive way to bring audiences into the world of `TRON: Legacy' and kick-off the countdown to the film's highly-anticipated launch." If you're from Metro Manila or Cebu and you have a Facebook account, find out how you can win tickets to “TRON Night” by visiting the Walt Disney Studios Motion Pictures Philippines Facebook Fan Page at http://www.facebook.com/waltdisneystudiosph. Promo period is until Oct. 22 only. In “TRON: Legacy,” Sam Flynn (Garrett Hedlund), the tech-savvy 27-year-old son of Kevin Flynn (Jeff Bridges), looks into his father’s disappearance and finds himself pulled into the digital world of Tron where his father has been living for 25 years. Along with Kevin’s loyal confidant Qora (Olivia Wilde), father and son embark on a life-and-death journey of escape across a visually-stunning cyber universe that has become far more advanced and exceedingly dangerous. Distributed by Walt Disney Studios Motion Pictures Philippines, “TRON: Legacy” will open across the country in IMAX 3D, Digital 3D and regular formats.